It has been written a lot on how to tune cars and how to get more power at full speed or higher performance on the drag strip. But for us who cruise along in a leisurely pace, there is not much, this is why we have written this article about how to think when you tune your engine for normal driving conditions. gasoline." Which is just partly true…. We must therefore look a little deeper into this issue a little later. Group 1: Cadillacs from 1948 to 1956 with 331cui engine. Group 3: Cadillacs between 1971 – 1980 (non-injection engines). 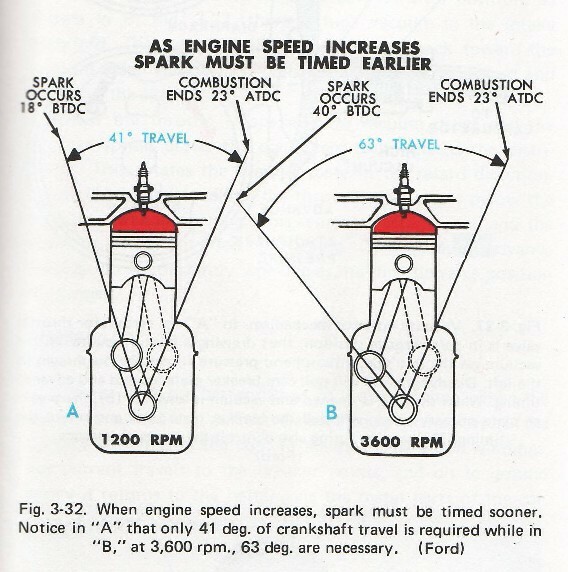 There is an old rule that says, if you only put the ignition and carburetor adjustments according to the original shop manual and instructions you have done everything you can. Unfortunately it is not so easy nowadays. Cadillac engineers optimized the ignition, carburetor, and camshaft angles according to the gasoline available at that time and this is not equal to what we have today. First, a bit basic gasoline theory. We're often talking about octane ratings, which we really is a measure of the flame spread velocity. The higher the octane the slower the gasoline is burning. In the early days the gasoline had lead additives, it was sometimes called Ethyl gasoline and was first introduced around 1920th. The lead additives task was to cool and lubricate the valves of the engine. Moreover, the gasoline also contained a small amount of sulphur, which mainly had a cooling effect. During the years, the sulphur content has decreased sharply. 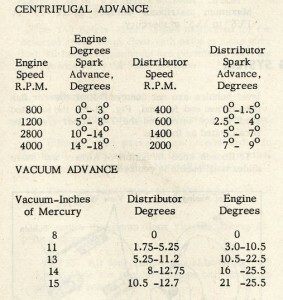 To better understand the lead information you have to do a historical review of how our old engines were made. The valves of the engine is cooled at the time they are closed by contacting the valve seat which in turn is cooled by the cooling water jacket in the cylinder head. See picture below for principle. 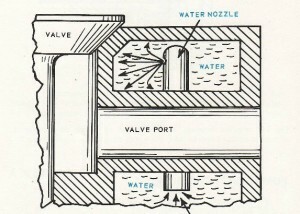 In the early days limitations in the casting technique put a stop to make the material between the valve and the cooling jacket as thin as needed to effectively cool the valve. During the 50th century GM was leading the way forward with their casting technology by the development of Chevrolet's new small-block engine. It was in connection with this project that the Cadillac 331 engine got its new heads. 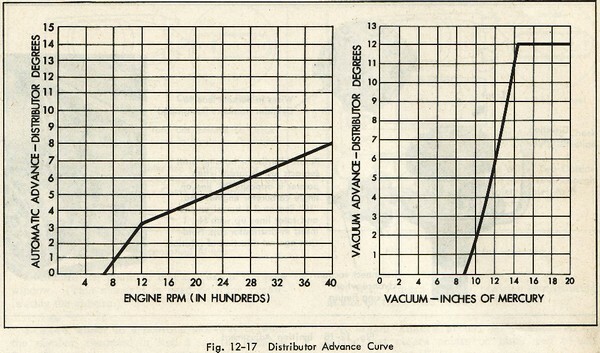 But the “horsepower war” was helped by the lead additives and made it possible to get out more power. Physics behind this is that when you vaporize the lead additives collected on the valves and piston tops, you take the energy (heat) from the surface it sits on and so creating an additional cooling of the valves and pistons. The sulphur had similar effects but with lower efficiency. 95 octane, which has the octane rating between 95.2 to 95.5. And contains 5% ethanol, and a very low sulphur content. 98 octane, which has the octane rating of between 98.1 to 98.4 and has up to 5% ethanol and low sulphur content depending on supplier. Shell V-Power™, which has an octane rating of around 99.2 with up to 5% ethanol and some additives for valve cooling. Note : Check with your local supplier or see gas supplier websites as the additives changes over time and unfortunately for us classic car owners the future will probably mean more ethanol or other renewable additives which our old engines are not designed for. Keep your eyes open for changes and ask your supplier if in doubt. 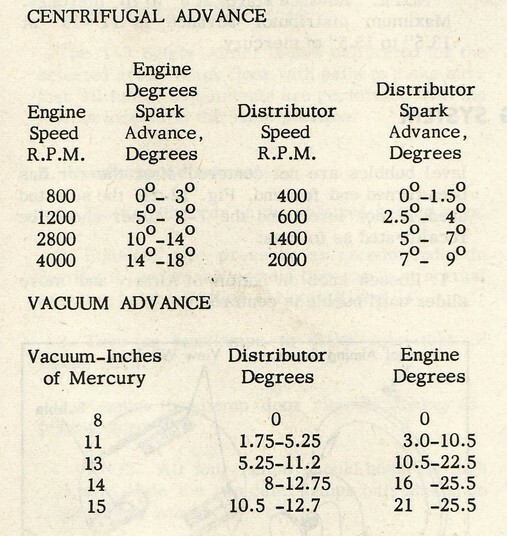 If we very roughly compare the current gasoline with the gasoline the 3 different groups engines were developed for we can see the following. Group 1 was developed for about 89-90 octane with lead and high sulphur content. This group will run on 95 octane and lead replacement for valve cooling. Group 2 was developed for 98 to 100 octane with high lead and sulphur. This group should be using 98 octane with a good valve cooling medium, cooling is more important than the octane increase. Group 3 are built for 87-89 octane and run on 95 octane without additive. We will look at 3 very common fuel claims directly. My Cadillac performs really good if I mix in 50% E85. Of course they run with 50% E85. In group 1 cars, this is very risky when you have open crankcase ventilation. Engine oil is broken down quickly with a high risk of total breakdown. Maximum of 10% addition of E85 applies in all groups. An addition to the content of ethanol above 10% rapidly reduced the engine oil life. If the engine is healthy it will perform worse and run warmer. 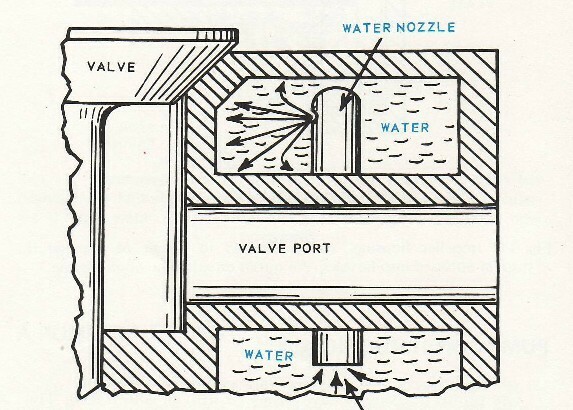 Most likely you will have thick deposits in the combustion chamber probably due to leaking valve guides. These deposits provide a source of ignition and this affects the combustion, so that it burns too fast. Or you have the wrong ignition timing. My Cadillac only runs good if I drive it on 98 octane and lots of octane additives and I have also retard the ignition when I suspect that the gasoline is too bad. Very likely is that the engine has been run with just fresh water instead of a glycol mixture, and have rust or other deposits in cooling jackets and the exhaust valves get too hot. Full optimization of fuel consumption and performance begins with the optimization of the ignition timing. But only after a compression test. Very roughly one can say that 9.5 to 10.5 kg/cm2 is low compression engines that require 95 octane. Over 11.5 kg/cm2 is high compression engines. 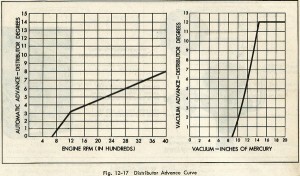 In many Group 2 cars that were driven in the U.S. in the late 70's and onwards, many find that the compression is lower than what's specified in the original data. It is very common that the 365, 390, 429 and 472 have been rebuilt to low compression. Especially common are the early 472s, Cadillacs real high performance engine, but it is not uncommon that someone has simply switched to a 472 from the 70s, which is something completely different. The only way to see if you have a genuine 472 is a compression test and it should be around 12.5-13.5 kg/cm2. The problems in group 2 cars is not the current gasoline in Sweden of today, but what they were running on during the 70's and 80's. The combustion is, of course the means to make the engine run in an efficient manner. Therefore it must be finished about 23o to 25o after the top dead centre point. 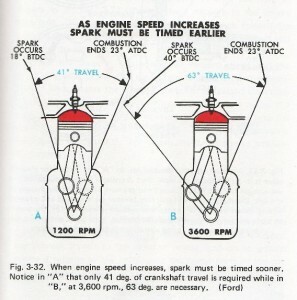 To achieve this, the ignition vary with speed and load. This is the reason for the centrifugal advance mechanism and a vacuum regulator on the distributor. Centrifugal regulator increases the ignition timing with engine speed. On a standard engine this begins at about 500rpm and is fully advanced by about 15 °, between about 2200 and 2500 rpm. It is very important that this mechanism is in perfect condition and not stuck or springs are too soft so that it increases the ignition is too early in relation to speed, or too hard so they do not regulate at all. 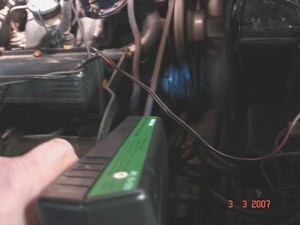 The vacuum regulator further increases ignition timing by about 15o. This is needed because when running at part load there is a ”high” vacuum in the intake manifold and a lean fuel mixture that burns slowly and therefore have to start burning earlier. It is with these two tools we have to adapt to today's fuel. If the Cadillac engineers in the 40-60 had had today's fuel they would have entered other values in the manuals and specifications. Among other things defects & problems in the above is also one of the reasons that there are common today with retrofitted electric fans on many old Cadillac. emissions. This you can experience clearly on many of our summer cruisings when the air is full of unburned gases.